همان‌طور که ایران در زمینه برنامه‌ریزی منابع آب با هدف توسعه‌ پایدار به پیش می‌رود، استفاده‌ مجدد از آب، از جمله برای مصارف خانگی، در میزان موفقیت و به‌کارگیری برنامه‌های کلی مدیریت منابع آب نقش مهمی ایفا می‌کند. به‌عنوان بخشی از این تلاش، مجله آب و فاضلاب ایران درخواست و اقدام به چاپ مقالاتی در زمینه استفاده مجدد از آب نمود. این مقاله در پاسخ به این درخواست تهیه شده و در سه بخش ارائه می‌شود و به طور ویژه به موضوع استفاده مجدد از آب و کاربردهای بالقوه آن برای مصارف خانگی در ایران می‌پردازد. در بخش اول این مقاله، اطلاعات لازم برای درک و ارزیابی پتانسیل به‌کار‌گیری استفاده مجدد از آب برای مصارف خانگی در ایران ارائه می‌شود. عناوین مورد بحث در این مقاله شامل موارد زیر است: ۱) ملاحظاتی در رابطه با دلایل استفاده‌ مجدد آب برای مصارف خانگی در ایران، ۲) اطلاعات زمینه‌ای در مورد استفاده مجدد آب برای مصارف خانگی، و ۳) ارزیابی آب بازیافت‌شده برای مصارف خانگی در مقایسه با دیگر منابع آبی. اطلاعات ارائه‌شده در این مقاله برای فهم مسائل و چالش‌های ارائه ‌شده در مقالات بعدی ضروری است. مسائل فنی و مقررات مربوط به سلامتی عمومی و محیط‌زیستی در ارتباط با استفاده مجدد آب برای مصارف خانگی در بخش دوم ارائه می‌شود. در مورد راه‌های پیشبرد این اهداف و مقابله با چالش‌ها، از جمله ارتباطات و تبلیغات عمومی در ارتقای دانش مردم، در بخش سوم بحث می‌‌شود. As Iran moves forward with the development of a sustainable integrated water management plan, water reuse, including the potable reuse, can play an important role in the overall success and implementation of the plan. 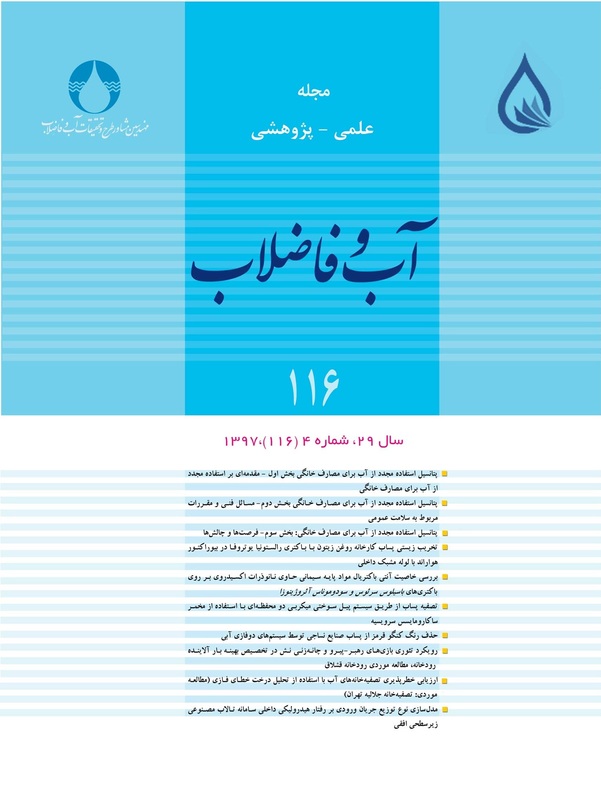 As part of this effort, the Iranian journal of water and wastewater requested papers on the subject of water reuse. In response to that request, this paper, to be published in three parts, deals specifically with the subject of water reuse and the potential application of potable reuse in Iran. The principal focus of this paper (Part I) is on the background information that is necessary to understand and assess the potential application of potable reuse in Iran. Topics addressed in this paper include: 1) consideration for why potable water reuse in Iran, 2) background information on potable water reuse, 3) a comparative assessment of potable water reuse with alternative sources of water supplies. The information presented in this paper is needed to understand the issues and challenges presented in the subsequent papers. Technical and regulatory issues related to potable reuse are considered in Part II. The path forward and implementation challenges, including public outreach, are addressed in Part III. Damkjaer, S. & Taylor, R. 2017. The measurement of water scarcity: Defining a meaningful indicator. Ambio, 15, 1-9. Hazen, A. 1914. Clean water and how to get it, 2nd Ed., New York: John Wiley & Sons. Kayhanian M. & Tchobanoglous, G. 2016. Water reuse in Iran with emphasis on potable reuse. Scientia Iranica, 23(4), 1594-1617. NRC. 2012. Water reuse: Potential for expanding the nation’s water supply through reuse of municipal wastewater, National Research Council, National Academies Press, Washington, DC. Tajrishy, M., Abdolghafoorian, A. & Abrishamchi, A. 2014. "Water reuse and wastewater recycling: Solutions to Tehran’s growing water crisis", In: Quentin Grafton, R., Wyrwoll, P., White C. & Allendes D. (Eds). Global water: Issues and insights, the Australian National University. Canberra, Australia, ANU press. Tchobanoglous, G. 2012. New directions for wastewater treatment in the 21st century. Proceedings of 6th International Conference on Flotation for Water and Wastewater Systems, International Water Association, New York. Tchobanoglous, G., Cotruvo, J., Crook, E., McDonald, A., Olivieri, A., Salveson, R.S. & Trusselll, R. R. 2015. Framework for direct potable reuse, Alexandria, WateReuse Research Foundation, VA.
USEPA. 2017. Potable reuse compendium, United States Environmental Protection Agency, Office of Water, Washington, D.C.